One of the more distinctive buildings at the heart of the pedestrianised center of Vienna is the Grabenhof. With its columns and decorated golden railings, the Grabenhof makes quite a sight among the historical buildings that surround it. All the creativity seemingly went into the building’s architecture, though, rather than the name: Hof means court and Graben is the name of the street outside. You can spot it easily as you walk down the boulevard that connects Stephansdom cathedral with the Hofburg palace area, thanks to its location opposite the plague column. 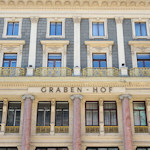 It also has the word “Grabenhof” written helpfully in large letters on its facade. The first constructions on the site date back to at least the 14th century. Sometime in the late 16th century, the owners put up the Renaissance-style Arkadenhaus. This was, in turn, replaced by the Grabenhof, finished in 1876 and designed by Otto Wagner and Otto Thienemann. There’s another Wagner design just a few steps away: the Ankerhaus at Number 10. The site is replete with history. For example, it was a bargaining chip for monasteries and dukes, provided holding cells for 16th-century courts, and once housed the company that published Schubert’s music. In 1804, they formally announced Francis I’s new title of Emperor of Austria from one of the balconies. This is less impressive than it sounds, since he unilaterally declared himself Emperor of Austria, fearing (accurately as it turns out) that his existing title of Holy Roman Emperor would soon be made redundant by Napoleon’s European adventures. Even the newer Grabenhof enjoyed its own brushes with history. It temporarily housed offices of the Third Reich, for example. In WWII, it was damaged by aerial bombing and during the land battle for Vienna. Upmarket stores (e.g. Longchamp and Mont Blanc at the time of writing) now fill the street-facing ground floor. It’s hard to miss, being on one of the main tourist walking routes through the historic center of Vienna.